The London bookseller Peter Ellis is offering for sale a host of various Plath-related items. The current price, via ABEbooks.com, is just over $300 US. This price is likely subject to change based on currently foreign exchange rates. The Harvard Advocate, vol. CI, no. 1. Cambridge, Massachusetts, May 1967. Wrappers. Several early poems by Plath. New Society, no. 302. London, 11 July 1968. Wrappers. Includes David Holbrook on Plath. The New Yorker, vo. XLVI, no. 40. New York, November 21 1970. Wrappers. ''Gigolo'', a poem by Plath. The New Yorker, XLVII, no. 3. New York, March 6 1971. Wrappers. Six poems by Plath. San Francisco Book Review, no. 22. June, 1972. A4 format, wrappers. 38 pages. Includes an essay on Plath by Emily Leider. The Listener, vol. 95. no. 2454. London, 22 April 1976. Wrappers. Includes an interview with Plath's mother. The New Review, vol. 3, no. 26. London, May 1976. Wrappers. Memoir of Plath by Elizabeth Sigmund. New Statesman, vol. 98, no. 2530. London, 14 September, 1979. Wrappers. Helen McNeil on Plath. Times Literary Supplement, no. 4115. London, 12 February 1982. Wrappers. Alan Brownjohn on Plath's Collected Poems. Island Magazine, no. 11. Tasmania, June 1982. Wrappers. Adam Philips on Plath. ''Private View'', no. 4. School of Art, CCAT, Cambridge. Spring, 1985. Large format. Wrappers. Includes one of Plath's letters home, illustrated by James Boyd-Brent. Photocopy of ''The Magic Mirror: A Study of the Double in Two of Dostoevsky's Novels'', submitted in partial fulfillment of the requirements of Special Honors in English, Smith College, 1955. 69 A4 sheets, preceded by three of preliminary matter. Photocopy from Smith Review, Fall 1952, of Sunday at the Mintons', a story by Plath. Also a photocopy of the story as it appeared in Mademoiselle magazine. Photocopy from Smith Review, Fall 1954, of ''In the Mountains'', a story by Plath. Photocopy from Smith Review, Spring 1955, of ''Superman and Paula Brown's New Snowballs'', a story by Plath. Also, a number, probably 40 or so, of photocopies of pieces on or by Plath, as well as bits of ephemera, such as a flier for Rose Leiman Goldemberg's Hampstead production of a play based on Plath's Letters Home (1975) and starring June Brown (Dot Cotton!). The condition is listed, "Generally at least very good." I should note that the "Superman and Paula Brown's New Snowballs" may actually be "Superman and Paula Brown's New Snowsuit". There is an exhibit at the Manuscript, Archives & Rare Book Library at Emory University's Robert W. Woodruff Library going on through 21 May 2008. The exhibit, "Visions and Revisions: An Exhibition of Poems in Progress", is "drawn from the literary collections of Emory’s Manuscript, Archives and Rare Book Library, “Visions and Revisions” charts the trajectory of individual poems, beginning at the poet’s desk with notebooks and handwritten drafts and concluding with published volumes and broadsides. By assembling multiple drafts of single poems by celebrated writers such as Carol Ann Duffy, Seamus Heaney and Natasha Trethewey, this exhibit represents how poetic vision is first conceived, then revised, and eventually realized." Plath is listed as a poet represented on a search I did. And, it's free! The following are some interesting links for the week ending on 23 February 2008. Casting Call Pro is searching for actors and actresses for a play in London about Ted Hughes's last moments before passing away in 1998. The performance will be one night only on 27 March, 2008, at the Blue Elephant Theatre (59a Bethwin Rd (entrance in Thompson's Ave) Camberwell, London, SE5 0XT). An interview with Richard Murphy by Eugene O'Connell published in December 2007. Better late than never! The interview includes some Plath & Hughes commentary. The Guardian's Sally Vickers "Disturbed lives" reviews Mad, Bad and Sad: A History of Women and the Mind Doctors from 1800 to the Present by Lisa Appignanesi. Do you prefer these week-ending summaries or would you prefer a more "as-it-happens" system of notifications? Please let me know. Did you know that Sylvia Plath's father was just five months older than Plath's literary idol D. H. Lawrence? Otto Plath was born on 13 April 1885. D. H. Lawrence followed later that year on 11 September. Per a recent query regarding the fees for Plath Profiles, a new and forthcoming online journal for Sylvia Plath studies...As of now, the first issue will be free. Though a fee is being considered...so please stay tuned. Over the next several months we'll know more! This week saw a flurry of news and blog activity regarding Sylvia Plath as it was the somber 45th anniversary of her death. London's Daily Telegraph ran Seduced by Sylvia Plath's gore and gloom on 11 February. There are some reviews out of a new book by Lisa Appignanesi called Mad, bad, and sad: A history of women and the mind of doctors from 1800 to the present. The New Statesman's review was published on 14 February; and The Guardian's was published today. I posted a link to Sylvia Plath's Library, cataloged on LibraryThing. It will give researchers an opportunity to analyze Plath's library and her reading. And, if you're a LibraryThinger, you can see how many books you have in common with Plath! Julia Stiles' adaptation of The Bell Jar was in the news again, but only for being in production. This is an informational posting for those seeking to submit to Plath Profiles, a new interdisciplenary journal for Sylvia Plath studies. Volume 1* will contain highlights of the Sylvia Plath 75th Year Symposium, held in October 2007 at Oxford University. As ever, if there are any other questions, please feel free to email me, or comment through the blog, and I'll work to get answers! Stay tuned for more information. *Per the abstract for the session at the Symposium. 45 years ago today on Monday, 11 February 1963, Sylvia Plath took her life. To honor her life and memory, over the last few weeks I have been cataloging the books in Sylvia Plath's personal library into LibraryThing. Plath's library is split between three venerable institutions: Smith College, Indiana University, and Emory University. The SylviaPlathLibrary re-assembles her library as it once was. There are other famous libraries on LibraryThing, please see the I see dead people['s books] group for more. There are bound to be more books out there; if you know of any, please send me an email with as much information as possible. I should add this catalog does not currently show titles Plath read but did not own. I hope to add the titles Plath read or mentioned but did not own; but pinning down these titles and their specific dates and editions is much more difficult. One title that jumps to mind immediately is Generation of Vipers, which she references in her poem "The Babysitters". I find it odd that there is no holdings information on The Colossus or The Bell Jar between Smith, Indiana, and Emory. Where are Plath's own copies of her books? Following the example of other author's libraries on LibraryThing, I added books to the catalog published by either Sylvia Plath or Ted Hughes in Plath's lifetime; from The Hawk in the Rain by Ted Hughes in 1957 through The Bell Jar by Victoria Lucas/Sylvia Plath in 1963. 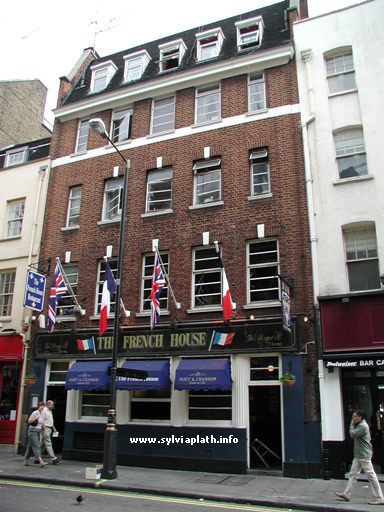 Pregnant with her first child, Sylvia Plath entered the York Minster Pub (pictured) on Dean Street in Soho, London, 48 years ago today, and signed the contract for her first collection of poems, The Colossus. In a letter she wrote to her mother and brother the next day, Plath ran through the happy events, "picture (yesterday) you daughter/sister, resplendent in black wool suit, black cashmere coat, fawn kidskin gloves from Paris...and of enormous and impressive size, sailing into the notorious York Minster Pub on Dean Street in Soho...and up to the bar to meet a pleasant half-American, half-Scots young editor for the well-known British publishers, William Heinemann...and taking out a pen thereupon and signing on the counter the contract for her first book of poems; namely, The Colossus." She signed the very happy letter, dated 11 February 1960, "Your new authoress". The following event will take place on Wednesday 6 February 2008 at the University of Texas at Austin. Poetry on the Plaza: Sylvia Plath and Anne Sexton — Noon Wednesday. Readers share poems from Plath and Sexton and from poets who inspired and were inspired by them. Ransom Center, 21st and Guadalupe streets. Free. 471-8944 , www.hrc.utexas.edu. On 5 June 2007, I posted on the letters to J. Mallory Wober from Sylvia Plath held at King's College, Cambridge University. I've recently acquired photocopies of the letters from the Archives Centre, and have itemized them below. Most are undated, but the letters are in an approximate chronological order. There are 25 letters, plus three additional pieces - a concert program, an admission ticket, and a telegram. Sylvia Plath met J. Mallory Wober in the fall of 1955 early in her matriculation at Newnham College, University of Cambridge. Though Plath was still somewhat invovled with Richard Sassoon that fall, she and Wober dated briefly that fall and early into the winter of 1956. In addition to Wober and Sassoon, Plath dated a few other men casually before she met Ted Hughes on 25 February 1956. The letters listed below are held at the Archives Centre, King's College, University of Cambridge, in England. The letters show Plath being witty, flirty, and very interested in Wober. There are some really interesting items here, such as a ticket to Bartholomew Fair, which Plath had a role in that fall, and a telegram from the south of France where she visited during break from school with Sassoon. Letters sent to Wober reached him at his Cambridge address of 7 Peas Hill and his London address of 71 Wentworth Road, London NW11. Plath visited him at both addresses. Several of the letters feature illustrations, and there is one beautifully illustrated envelope. Plath's letters were sent from Whitstead 4 Barton Road in Cambridge, and in care of American Express, 11 Rue Scribe, Paris. 1. Autograph letter signed. Whitstead, Thursday. With envelope. 2. Autograph letter signed. Friday evening. 3. Typed letter signed. Wednesday morning. With envelope. 4. King's College Musical Society - Open Concert. Sunday, 23 October 1955. Program. 5. Autograph letter signed. Saturday, 29 October . With envelope. 6. Autograph letter signed. Whitstead, Saturday. With envelope. 7. Autograph postcard signed. Undated. Henri Rousseau's "The Sleeping Gypsy" on postcard. From the Museum of Modern Art, 11 West 53rd Street, New York. 8. Autograph letter signed. 23 November 1955. 9. Autograph letter signed. Undated. With envelope. 10. Autograph letter signed. Wednesday also PM. With envelope. 11. Autograph letter signed, illustration by SP of SP as reflected in a mirror. Undated. Illustrated envelope. 12. Typed letter unsigned. 23 November 1955. With envelope. 14. Autograph letter signed. Undated. With envelope. 15. Autograph letter signed. Postmarked 24 November 1955, Cambridge, on envelope. 16. Ticket for Amateur Dramatics Club Theatre / Park Street performance of Bartholomew Fair, Friday 25 November 1955. With envelope. 17. Typed letter unsigned. Undated. With envelope. 18. Autograph postcard signed. Undated. With envelope. Dürer's "The Little Horse" on postcard. From the National Gallery of Art, Washington, D.C.
19. Autograph letter signed. Monday a.m. With envelope. 20. Typed letter signed. Tuesday afternoon. Postmarked 13 December 1955, Cambridge, on envelope. 21. Typed letter signed. Thursday evening, 5:45 p.m. Postmarked 16 December 1955, Cambridge, on envelope. 22. Autograph letter signed. Undated. Postmarked 19 December 1955, London, on envelope. 23. Autograph postcard signed. Postmarked 24 December 1955, Paris. Miro's "Femmes oiseau au clair de lune" (1949) on postcard. 24. Typed letter signed. Thursday night, December 29th. Postmarked 30 December 1955, Paris, on envelope. 25. Autograph postcard signed. Postmarked ? January 1956, France. Postcard of the Cote D'Azur. 26. Post office telegram. Postmarked 5 January 1956. 27. Autograph postcard signed. Undated. Postmarked 16 January 1956, Cambridge. Donatello's sculpture of Saint John the Baptist on postcard from National Gallery of Art, Washington, D.C.
28. Autograph letter signed, illustrated. Tuesday. Postmarked 8 February 1956, Cambridge, on envelope. Wober has gone on to become an author a number of books and articles in the field of media studies.